The French U20 youth international basketball season is almost over and Grégory Halin has confirmed his roster for the European Championship which is the last event of 2013. With France also participating at the 2013 U19 FIBA World Championship for Women this summer, Halin decided to work with just 16 players this summer. 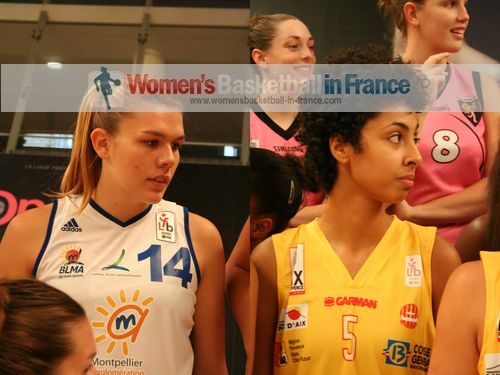 From the 12 players finally selected Justine Barthelemy and Vivianne Adjutor (in picture above) are the only players not to have represented France before at a FIBA sanctioned event. All the same both players have had limited experience playing in the LFB with Lattes Montpellier and Aix-en-Provence during the 2012-2013 season. The FIBA Europe 2013 U20 European Championship for Women Division A runs from 4-14 July in Samson, Turkey. France are drawn in Group C with with Hungary, Italy and Russia. France have not won a medal at these championships since their gold medal in 2009, having finished 4th in 2010 and fifth in 2011 and 2012. Esther Niamke who missed last season's youth internationals due to changing universities in America and summer school requirements is the only member of the roster not currently based in France. One interesting note about the 12 players in the list below is that they have all played in the LFB some time in their career.